First up, I always enjoy the drive up to New York City. I enjoy the city too, as an artist there’s so much to take in visually, it’s pretty damn awesome. I also find myself thinking “Wow, no wonder this is where comics were born.” in the sense that you can just look around an imagine these epic things taking place up in the sky, or smashing through buildings. NYC is escapism at it’s finest hour. In another life, I would have moved there in a heartbeat if given the opportunity to do so. I decided to go pretty last minute after a tweet I saw a few weeks back from CB Cebulski about Marvel possibly looking at work there, plus there were a ton of our favorite creators and my old colleagues there too, PLUS we love New York. It just seemed like a no brainer road trip to do what we love. As an artist seeking work at Marvel it’s also nice to have a feel for what’s coming and read everything going on. So I wanted to get the scoop on what was up with Marvel and hints to what was coming soon. That way if you do get the call, you can jump right in and have an idea of what’s up. 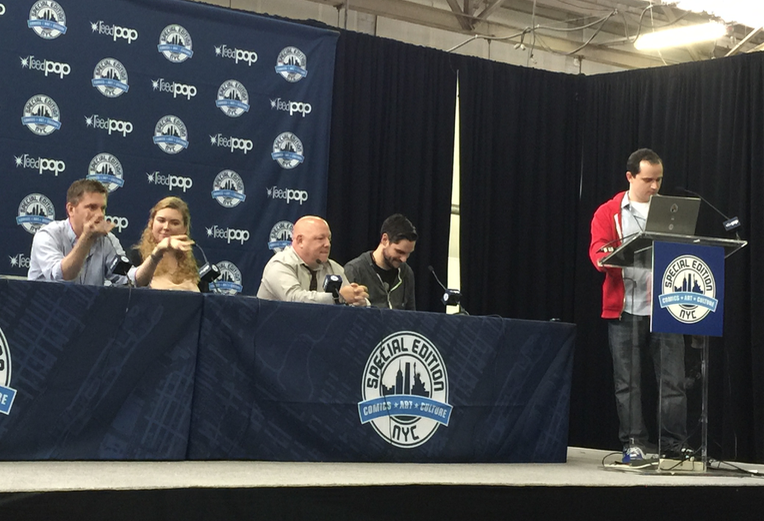 God bless those guys and girl for being patient with the mic situations, apparently the speakers were all wonky, and then there was a neighboring panel next door to contend with…. wait, “next door” is too kind. It was behind a neighboring curtain which seemed an odd setup for these “theaters” for paneling. A minor inconvenience as the mighty Marvel panel moved on with top Marvel creators Charles Soule, Brian Bendis, Marguerite Bennett, all dropping knowledge and appreciation on fans. Also of note, moderator Rickey Purdin, who is pretty new at Marvel, did a great job of leading the panel and keeping it fun for the audience. The biggest thing I took away from that panel was that these people friggin care about the stuff they are making and a lot of thought and planning goes into this. Not some willy nilly “reboot” some news sites were on about. As I’ve been away from comics for some time, it’s a refreshing thing to step back into. Oh, and for Star Wars fans like me… there’s going to be a mother fraggin LANDO CALRISSIAN comic! I like the way Charles Soule said the character would be written as a bad gambler always chasing the next big bet to cover the last fail. Excited for that. 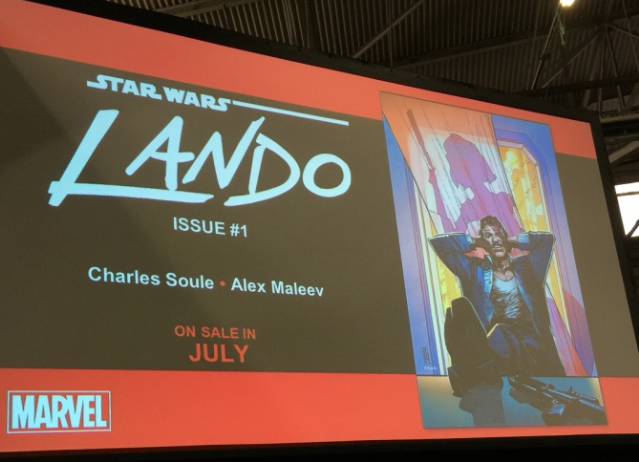 Alex Maleev draws an awesome Lando! Closing note on that panel is that Bendis will fight Charles Soule till they are bloody for an Indiana Jones comic writing gig. Bendis told Soule he could write the Short Round comic. Haha. 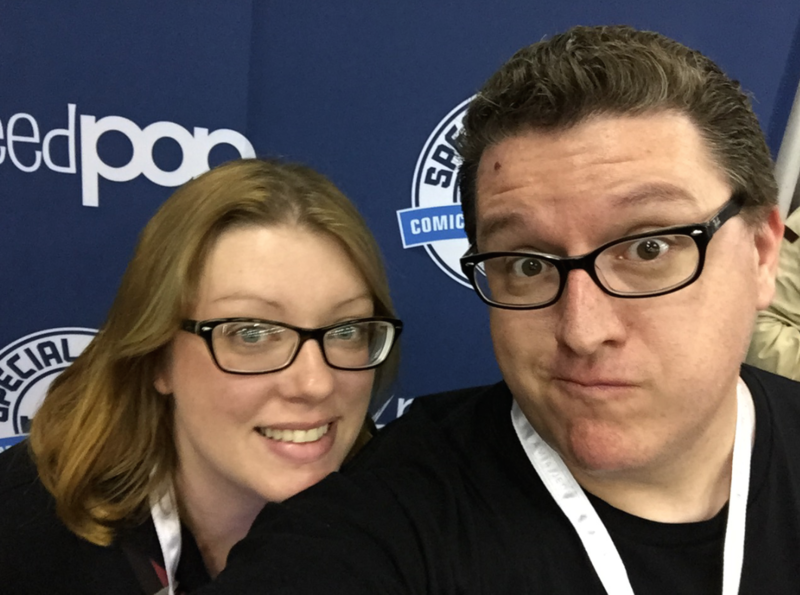 The business of comics panel was headed up by writer Alex de Campi (the writer of wrongs) and she had some good info for beginning creators about bad contracts and things to avoid. I wish I would have had panels like this at the comic cons I grew up with, but sadly for years nobody wanted to talk about these types of things for fear of being blackballed or whatever. I’ve signed a few bad contracts in my day, but I feel like I’m all the wiser now for it, and it totally makes me appreciate everything they have to say. It’s truth. Listen! One thing I wanted to share for fellow creator friends, if anyone was in any trouble with rights, or “fuckery” from companies as Alex called it, there are lawyers who will rep you for like $25 bucks. See www.calawyersforthearts.org for details. There was also a nice page rate graphic I’ll have to dig up. I get a lot of aspiring creators asking me about that stuff. It was great to run into old friends in comics. People genuinely happy to see me and that I was back at this. I’ve been away for a bit and out of the hustle and flow. Running into Bendis randomly, who embraced me with a big hug when he realized it was me (I look completely different now) and humbling had words about my art, it meant a lot to hear. Bonus: I was able to pull Ally out of Jason Latour’s line to say SEE, I told you I knew that guy. 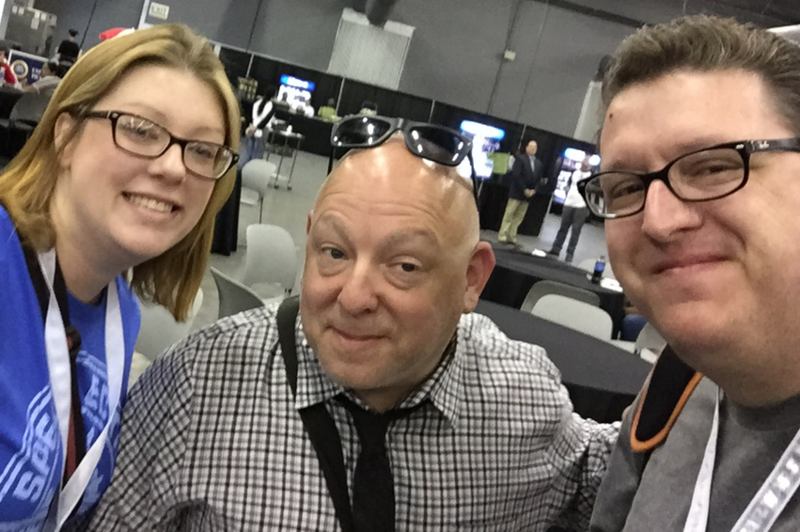 Bonus bonus side note… Ally was in line for Latour and I guess fans in line were grumbling about “wow all those people are waiting in line to see Bendis and he’s right there…” and then I come bumbling along and wave her over to meet my old friend. Sorry suckers! BOOM BOOM STUDIOS FAN FOR LIFE. Seriously though, I left the show feeling very humble, grateful and inspired. This is such a small industry, knowing that it is one where people ultimately take care of each other, makes me proud to play a part in it. At some point Ally says…. “Dude, it’s like people just thought you were gone and didn’t know where you went.” And I was gone. But now here I am again.